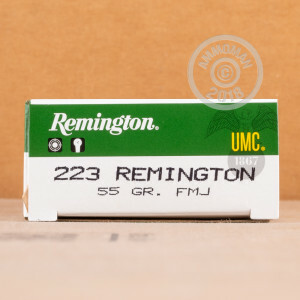 Invented in the 1960's, the 223 Remington has come to be one of the most beloved rounds in the world. Giving people a lighter round with a very small recoil that is used in an easily maneuverable rifle, this round is superb for military, law enforcement, hunting, self defense and sport shooting use, giving you the all purpose round you need. Remington has been around since 1816, and their products have a reputation for being high quality and reliable. 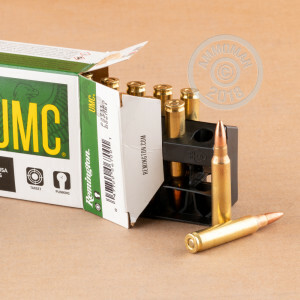 These Remington UMC rounds are perfect for volume shooting at the range. 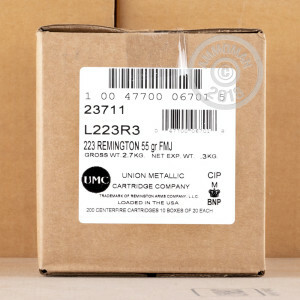 Each round in this box of 20 features a 55 grain metal cased projectile which is Remington's name for a full metal jacket. These rounds are loaded into boxer primed brass cases that are non-corrosive and re-loadable. Do you need more than 20 rounds? At AmmoMan.com all orders over $99 will ship for FREE!